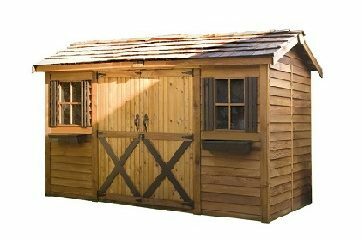 The handsome LongHouse Cedarshed comes as pre-fabricated panelized shed kit is versatile, simple and stylish. The LongHouse Cedarshed features a 60″ double door along with two fixed pane windows with decorative shutters, and planter boxes to accentuate the exterior. This durable premium Western Red Cedar shed is the most attractive storage solution on the market, and may be used for all of your outdoor storage needs.